Your project for today is to deep clean your bathroom(s). Set the timer for 20 minutes and put toilet cleaner in each of the toilet bowls and let it soak. Remove any items that don’t belong in the bathroom, put away items that need to be put away in the bathroom, empty the trash. Spray and wipe down the sink and tub. Finish swishing and cleaning the toilet. Shake the rugs outside (or throw them in the laundry) and mop or vacuum the floors. 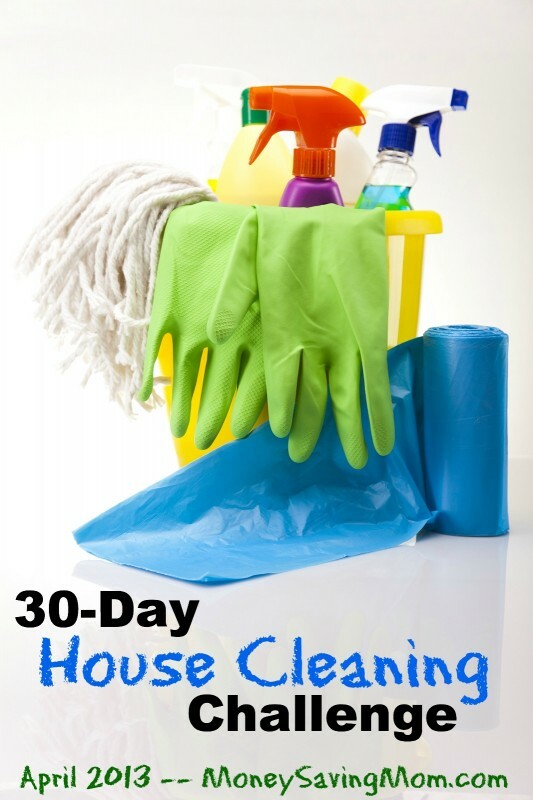 Wipe down the outside of the cupboards and clean the mirror. As for me, I’m planning on scrubbing the bathroom floors and baseboards — something that often gets a little overlooked. I am going to follow your list and add to it cleaning out the medicine and vanity cabinets. Oh good idea about cleaning out the medicine and vanity cabinets! Thank you for the reminder! Oh, those blasted baseboards! How can such a little ledge so close to the floor cause so much grief. Mine need some desperate attention throughout the whole house. Today I plan to do a quick pick up and surface clean of most of the house, although I will likely scrub down the shower when I get in it later on this morning. I have gotten behind for the past few days and I need to get myself back on track. There is a bit of clutter that has accumulated on the kitchen counter/breakfast table over the weekend and if I don’t clear those today I won’t be able to function! What is with those baseboards anyway? The ones in the kids’ bathroom seem to get worse than anywhere else in the house. Argh! I just deep cleaned all 3 bathrooms – who knew how much joy that would bring me! I am one happy girl! Today is day 1 for me so I have lots to catch up on. I wish I had seen the post when it first started. Oh well, better late than never! Woohoo! So glad it brought joy to you. And welcome to the challenge! You are so right about those bathroom baseboards. They are crud magnets at my house too! I have the 1/2 bath to clean today, the kitchen sink needs scrubbing and the counters thoroughly cleaned. I also have the downstairs to dust. Downstairs baseboards are on tomorrow’s chore list. I did the upstairs last week. What a coincidence! I started deep cleaning the master bathroom, early this morning, prior to reading today’s Challenge. (It really needed it, so…) Just have to finish up with the floors. I suppose I’ll spot clean the other two, as they were just cleaned. I usually try to hit the baseboards, mirrors, floors, etc. at least weekly as part of the routine cleaning. I’ve heard that dusting baseboards with a fabric softener sheet helps to “resist” dust. Does anyone know if that’s true? I’m hoping to get back on track. I was actually in Boston yesterday. I heard about what happened after coming out of a Red Sox game. Luckily, we are all safe. Prayers and thoughts for the people affected yesterday. I hope you are all scrubbing away on those bathrooms.